Oil on wood panel, 46cm wide, 36cm high. 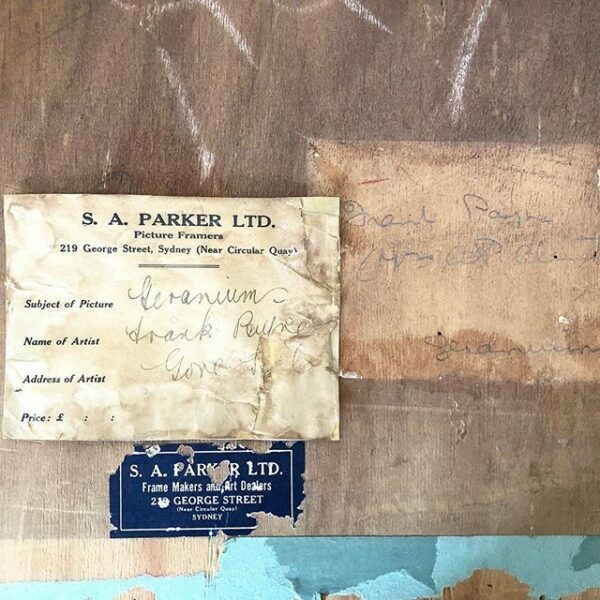 Framers label & artist info verso. This creative, female, Brisbane born designer and artist was ahead of her time. 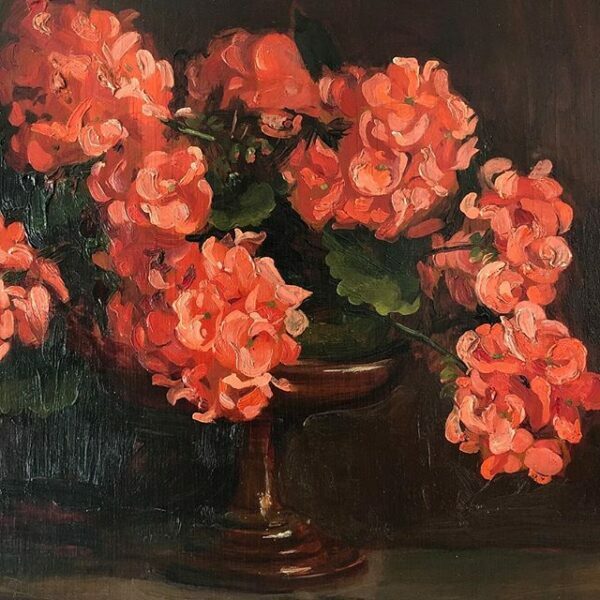 Forging a life dedicated to her artistic passion, she became, in the height of her popularity in the 1920’s and 1930’s, one of Australias highest paid female artists. 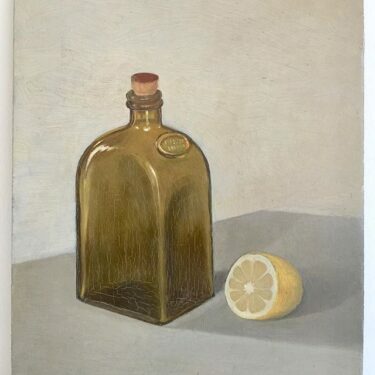 Mainly recognised for her portraits of children in natural settings and landscape paintings, this one of only two recorded Still Life painting by Frances Payne known to exist. 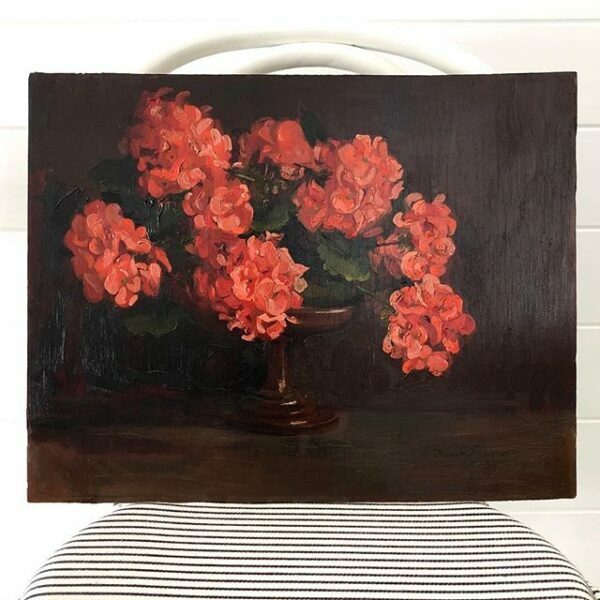 As with her 1919 landscape painting ‘Swan Bay, North Stradbroke Island’, Geraniums is painted in oils on unprimed wooden panel. for the Brisbane Courier about her experiences; how exotic her life would have sounded to her readers back home in Brisbane. Payne returned to Brisbane in 1907 and began freelance design work for the Courier, Bulletin, and also earn’t her living illustrating commercial catalogues and travel brochures. After relocating to Sydney where she married, had two children and then separated from her husband. Frank Payne supported herself and her two sons with her commercial art work, becoming one of Australias highest paid women artists. 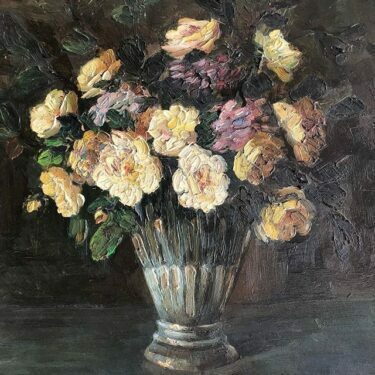 In 1919 she was a founding member of the Society of Women Painters and was friends and acquaintances with many prominent women artists including Jessie Traill, Ethel Carrick Fox and the author Dorothea Mackellar. 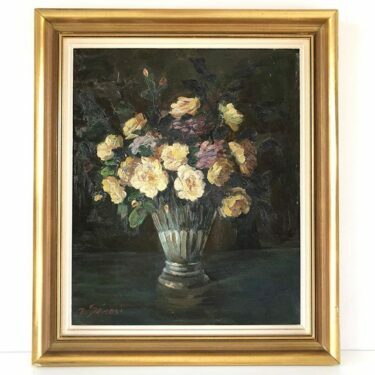 She exhibited in many of the Societies exhibitions and continued to paint in oils and watercolour well into her senior years. Frank Payne died in Normahurst in 1976 and is survived by her two sons. -2011 A retrospective exhibition ‘Frank Payne: The Forgotten Artist’ was held at the Redland Art Gallery in Brisbane, curated by Ross Searle. – 1952 Grosvenor Gallery, Sydney.